Friendships across generations are vanishing – in the UK, libraries, pubs, youth centres and clubs are closing at a shocking rate, with 600 youth clubs shutting down over the last six years. Churches are some of the last places where generations meet. But do we make the most of that chance? Green: Schedule a meet-up with someone from a different generation. Amber: Schedule a monthly hang-out, and serve while you do – what can you do to help them? Red: Find someone in your church (or anywhere) who you know, and decide to ‘adopt’ them. Take them under your wing, and make them a part of your life. When I first volunteered with YLI, I recall meeting with a group of skater guys, aged 14–16, who wanted to raise funds for a skate park. I walked into their town library, and there they were sitting in their hoodies on these big wooden chairs around a grand old table, chatting about their plans. At first glance you wouldn’t have thought it, but these kids had real dreams for what they wanted to build in their community, and creativity in raising the money for it too! Together we laid on an extreme bingo event that was a hit with their village. Out of that, we got to know one of those skater guys really well, and he later spent a week at our summer camp, Cairn Brae, where he gave his life to Christ. Even that wasn’t the end of the story because I then began meeting up with him to read the Bible together. Now he’s a YLI leader himself, encouraging teenagers to share their faith with their friends. And it all started with that unlikely library meeting. The barriers we create can prevent us building relationships and demonstrating love towards one another. Technology, language, opinions, worldviews, experiences and all sorts of prejudices and stereotypes add to them. Yet, with God, these barriers are not insurmountable. What might it look like for you to ‘adopt’ someone who is different from you? Perhaps it starts simply by introducing yourself to someone of a different generation. Amazing things could happen if, in Christ’s strength, we set aside the barriers that stand between us: think of what a powerful witness a multi-generational community of believers could be to the divided world we live in today; think of what we could learn from one another; think of how God could use you to speak into someone else’s life; and above all, think of Jesus, who overcame all barriers to save us. Euan is on staff with Young Life International, a global youth ministry seeking to introduce teenagers to Jesus Christ and to help them grow in their faith by going to where teenagers are and building personal relationships with them. 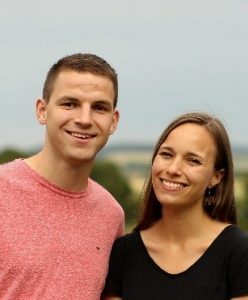 Having volunteered with YLI while studying Theology at St Andrews from 2014–18, he is now on staff to set up the ministry in Perth, Scotland, where he lives with his wife, Beth.